HB 3085 – Creates a new Family Farmer Loan Program managed by the state’s economic development agency, Business Oregon, to offer direct loans to family-scale farmers and beginning family farmers for land or equipment. HB 3090 – Establishes a new beginning farmer and rancher incentive program at the Oregon Department of Agriculture focused on issues of student loan and tuition assistance. HB 3091 – Reduces fees and costs to borrowers using the state’s existing ‘Aggie Bonds’ beginning farmer loan program, which incentivizes private lower interest lending to beginning farmers and ranchers for land and equipment. The three bills above have been sent to the House Committee on Agriculture and Natural Resources and have a public hearing scheduled at 3pm on Thursday, March 14. How to Submit Testimony: You can help us pass these bills by emailing a letter of support for HB 3085, HB 3090 and HB 3091 to the committee before the hearing. One, two, or all three bills can be listed in the same letter, but it’s important to say that you support them and to provide the bill numbers. Please say a few words of support for the bills and the need for the Legislature to support programs that help beginning and smaller farmers access land and affordable lending. If you have any personal stories to share about your challenges with accessing financing to start a farm or to purchase land or equipment, or with student loan debt getting in the way of starting or expanding your farm, please say tell those stories as this kind of information can be very powerful in helping the Committee members see the importance of these bills. Even if you aren’t a farmer, you can still submit a letter or email to let the Committee know you support these bills to help out beginning and smaller farmers. Make sure to list your name and address in your letters or emails to the the Committee. Address all emails and letters to the House Committee on Agriculture and Natural Resources and send them to the committee’s official email address at haglu.exhibits@oregonlegislature.gov. Once you’ve done this, let us know so we can track testimony and letters of support that have been submitted. In addition, another bill – HB 3092 – would establish a new, statewide beginning farmer tax credit to incentivize leasing land to beginning farmers and ranchers. This bill has been sent to the House Revenue Committee and has not yet been scheduled for a hearing. Lastly a bill to provide $10 million in funding to the new Oregon Agricultural Heritage Program (HB 2729) had a public hearing on February 12. This bill would provide grants for farm succession planning, and funding for both long term conservation planning and protection for working farmland at risk of development or conversion to non-farm uses. Read FoFF’s testimony in support of HB 2729 here. Canola bills introduced as an ODA Rules Advisory Committee debate future canola management in the Willamette Valley. The issue of canola in the Willamette Valley has been a hot topic among farmers for decades. The Willamette Valley is one of the best specialty vegetable seed producing regions in the world, and dozens of seed companies work with hundreds of farmers to produce high quality seed in the region. Because plants in the Brassica family can easily cross with each other (think brocolli, kale, cabbage, etc) a complex system of isolation distances, mapping, and coordinated management have been created to ensure that the seed you buy from Willamette Valley growers is true to type – ie red cabbage is red cabbage, savoy cabbage is savoy cabbage, purple top turnip is purple top turnip etc. Because canola (raised and crushed for oil) is also in the Brassica family but is not typically managed the same as high quality seed, there have been restrictions on canola in the Willamette Valley for years. In fact, there is currently a Willamette Valley Protected District where only 500 acres per year of canola allowed to be grown, a restriction that expires in July 2019. Without new rules, this could open the door to thousands or tens of thousands of acres of unregulated canola production, which would likely destroy the unique attributes of the Willamette Valley’s specialty seed production ability and the industry built up around it. HB 3026 and SB 885 – Each of these bills would maintain the current cap of 500 acres per year on canola in the Willamette Valley Protected District and not allow the current acreage cap to expire. HB 3219 – Maintains the current cap of 500 acres per year of canola in the Willamette Valley Protected District, but explicitly prohibits the production of genetically engineered or herbicide tolerant varieties. Contact your State Legislators today to urge them to support these bills to protect the Willamette Valley’s specialty seed industry. If canola is allowed in the Willamette Valley at all, there’s needs to be a limit on the acres grown and a clear prohibition on growing herbicide tolerant and genetically engineered varieties. More Bills Introduced to Address the Impacts of the Lost Valley Mega-Dairy – Take Action to Support a Mega-Dairy Moratorium! Earlier in the session, two bills SB 103 and SB 104, were introduced by the Senate Environment and Natural Resources Committee. SB 103 establishes a moratorium on new ‘industrial’ dairies (defined as those over 2500 cows, or other large dairies that do not provide seasonal access to pasture), while outlining changes to how water, air and impacts to smaller farms are considered when permitting these operations in the future. SB 104 would allow stronger local rules over siting of these facilities. These bills were introduced in response to the failed 30,000 cow Lost Valley Farm mega-dairy in eastern Oregon, which racked up hundreds of pollution violations in short amount of time after being permitted by state agencies in 2017. 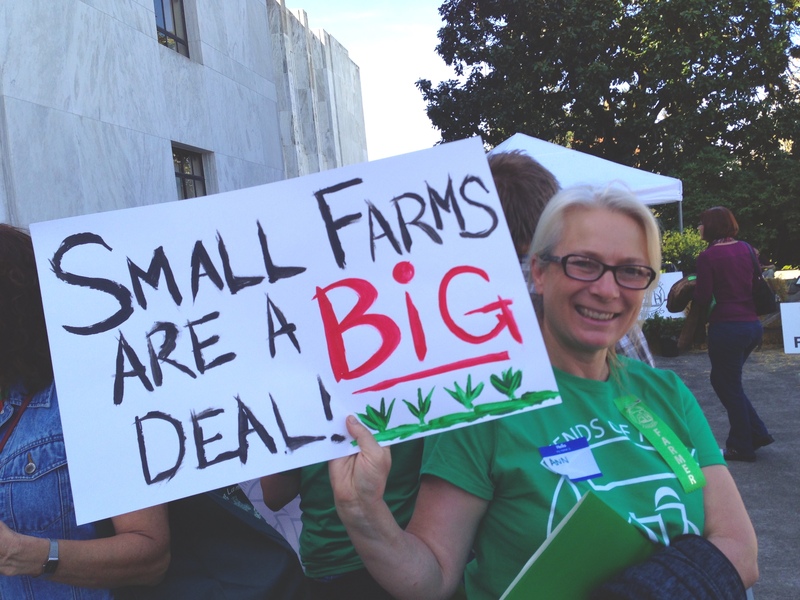 These bills have not yet been scheduled for a hearing – take action to support a moratorium on new mega-dairies in Oregon here! SB 876 – would create a two-step permitting process for large confined animal feeding operations to provide greater scrutiny before they go into operation. This is the first of two bills emerging from a work group organized by the Senate Environment and Natural Resources Committee. SB 886 – would set limits (not yet specified) on the use of groundwater for watering livestock at large confined animal feeding operations. This is the second of two bills emerging from a work group organized by the Senate Environment and Natural Resources Committee. HB 3083 – would establish a ‘Task Force on Large-Scale Dairy Farms’ which would submit a report to the Legislature by September, 2020.